A Giveaway and a Recipe. If you don’t follow @ShopMCE on instagram you MUST go do that NOW! And enter for your chance to win this beautiful Black Faux Fur Vest. Make sure you follow @ShopMCE, Like the photo, Regram the photo, and #ShopMCE! 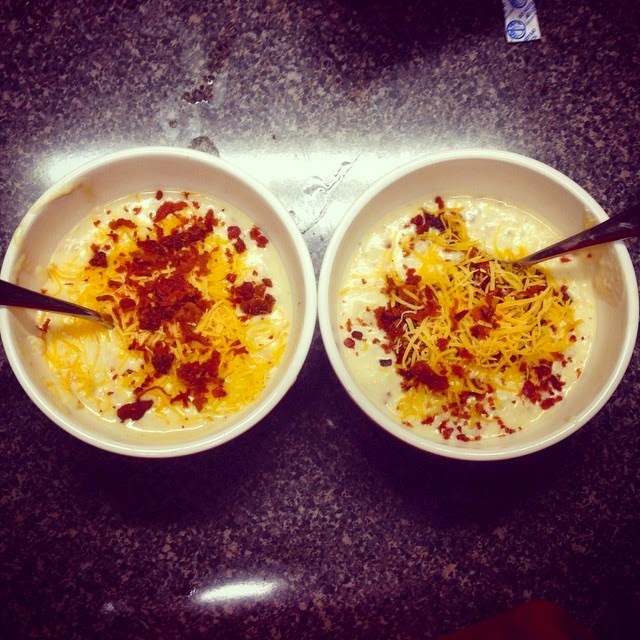 Last night I made Baked Potato Soup in the crock pot. I was a little nervous about it but it turned out super good. It’s honestly the easiest recipe ever. Once the cream cheese is completely mixed in, it’s ready to serve. Y’all, this stuff was GOOD. I made some garlic bread to go along with it and it was perfect. Husband approved, puppy approved, and I definitely approved. Make this tonight for your family and tell me what you think! Have a wonderful Wednesday pretty girls. Previous Post Oh Honey Butter, How I Love You. Next Post Fur + Plaid and A Little Help From My Friends. Totally pinned this post for the recipe, it looks delicious! I just entered on Insta, super cute!!! And that soup looks so yummy and simple, I will definitely have to try it. Thanks for sharing!